Hathway is one of the largest Multi System Operator (MSO) and Cable Broadband service providers in India. Our diversified product portfolio of Standard Definition (SD) and High Definition (HD) cable TV channel services, along with our High-Speed Broadband services, provides an array of exciting offerings to our ever-expanding customer base across the country. We have a Pan-India ISP license and are also the country’s largest Cable Broadband service provider. 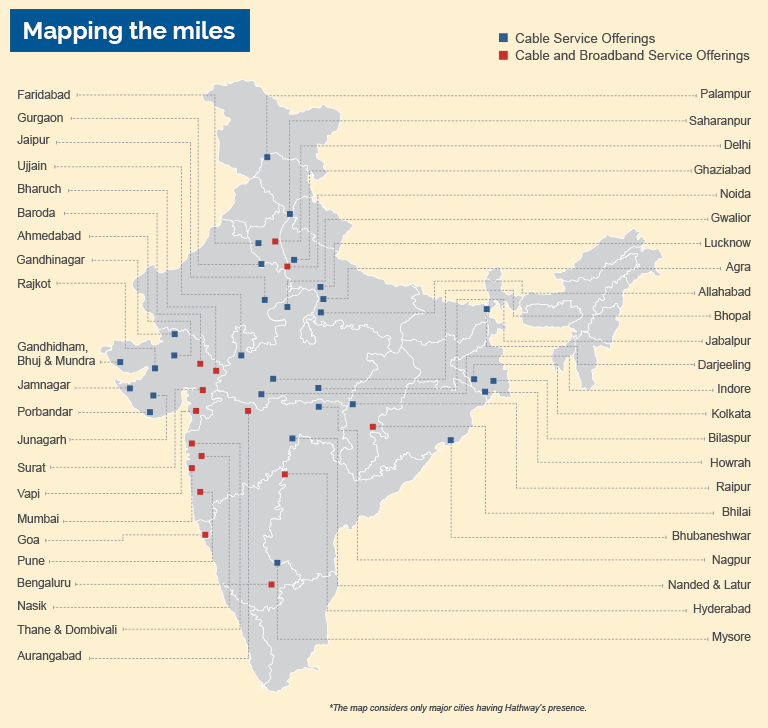 With our focus on connecting the last mile, we are currently serving 160+ cities and towns of India with Cable TV (CATV). Our Broadband services span 20 cities across the country. A robust digital CATV infrastructure encompassing 23 state-of-the-art digital Head-ends, sourced from global market leaders such as Ericsson and CISCO. HFC cable network connecting 11.8 million households for CATV and 8.5 million digital subscribers. More than 8.5 million Set-Top Boxes (STBs) seeded across the country. Emerged as India’s largest cable broadband service provider with approximately 2.3 million two-way broadband homes passes. 40% share of the total cable broadband market in India, endorsing our leadership strength. Our vision is to be a single point access provider, bringing into the home and workplace, the converged world of information, entertainment and services. Hathway’s mission is to provide an incomparable world-class TV viewing & Broadband experience to every Indian customer.